Been maintaining my weight loss from the hCG diet for a year and a half now – see that here. (actually as of this publishing, November 4, 2014, it’s been a full 2 years). But, like you, I’ve made mistakes along the way. I’m hoping that by sharing these with you today, perhaps it will help some of you avoid having to learn from painful experience yourselves. So let’s get into…..
Well, it probably sounds funny – none of us would probably consciously choose to carry out P3 this way, but it happens every day doesn’t it? Somewhere on this planet right this very second is at least one person on P3 who is scarfing down some toffee covered almonds. How do I know this? Because I was that person almost 3 years ago, at the end of my 2nd round of hCG. It was a dark and stormy October 2011. I cheated during much of the round anyway – you can hear my whole story on THAT another day. Lets just say things weren’t ON in my head or heart that round – it’s no surprise that nothing changed when P3 came. In short, I managed to gain back 14lbs of the 16lbs net weight loss I had that round, in just 9 weeks. July 24, 2011 I was 129.6lbs, and by Mid September, 2011 I was back in the 143lb weight range, right about where I was after Round 1. This was also the only round I did a 3 day load. Some people may need it, but when you are deciding on whether or not to do a 3 day load, ask your honestly why you’re considering it. In my case, I found it a nifty excuse to gorge on ice-cream and cake for one more day. Something I see as a poor choice now and one that I wouldn’t want to repeat. 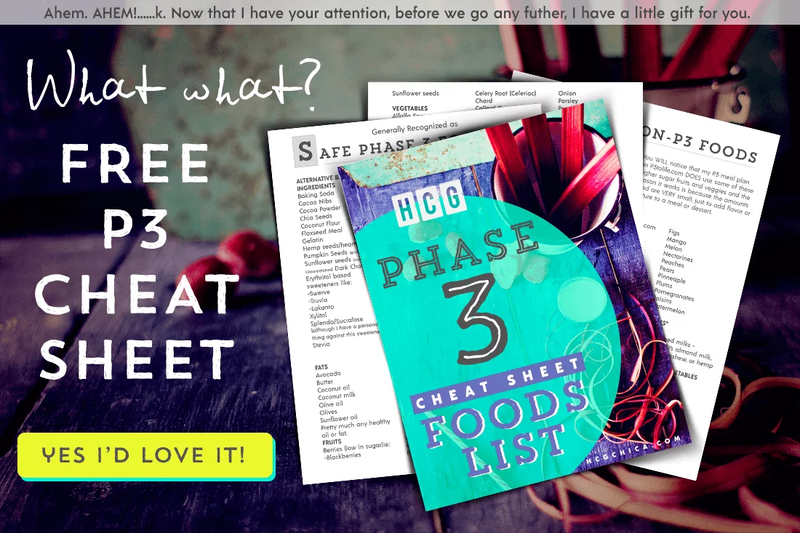 I have a whole post on deciding on a 3 day load for hCG here. I personally feel this crazy regression was sparked by my 2nd round of loading “dirty” which is why ever since then I am adamant about loading clean – for more info on that check out my article Low Carb / Clean Loading on the hCG Diet – Why Do It? This may not apply to all of you, but anyone who is a sugar addict like I was may want to check into this because it was the make or break point for me getting out of my rut. I will detail out the things that went wrong, poor choices that were made, etc. To help you guys hopefully AVOID the same thing happening to you! Here’s the basic timeline into the abyss. Found myself in a compromising situation at the start of P3 that I wasn’t ready to handle and my willpower totally caved. Gave up. Went back to bingeing. So basically, for a good P3, avoid all of the above! For some people, loading by eating whatever they want works fine and doesn’t come back to bite them in the behind. Not me. I actually never had an eating disorder until maybe a year before I started hCG when I was about 30 years old. I guess I might be one of the few to have something like this start later in life. It stemmed in part from it being one of the only things left that brought a sense of happiness and satisfaction to my life (if only for 30 minutes at a time while the sugar was sinking in) when my health had become exceptionally bad from what I believe to be Lyme Disease (along with Hashimoto’s Thyroid disease) and I was no longer able to do a lot of the things in my life that used to give me joy. My first round of hCG helped me break the bad cycle of daily bingeing on sugary foods that I had gotten into. We’re talking a true binge, with up to 3500 calories being consumed in the span of an hour on something like ice-cream or majorly processed cookie packages full of high fructose corn syrup. From the time I started my first round of hCG until the start of my 2nd round, a good 3 months went by. During that time I experienced clean eating and purged myself of those sugar cravings. When I loaded for my 2nd round, I didn’t give much thought to what I would consume and figured even though I hadn’t eaten any sugar for 3 months that a couple days of it couldn’t be so bad. I still remember ordering a very large slice of my favorite chocolate cake from a greek restaurant I loved and driving all the way across town just to pick it up and eat it. Of course that was only a small portion of everything I consumed during my 3 day load. What ended up being so bad about it is it literally seemed to trigger the binge/craving mentality in me again that had been gone most of the past 3 months. All of a sudden upon eating these foods again I found myself having a really hard time staying away from them once vlcd started. I feel it was the kick-off for my regression in this respect. Once I recovered from all the craziness, I resolved to never do that again and came to the realization that for a sugar addict like me, there was NEVER a good enough reason for eating sugar with abandon. Thus clean eating for loading was born for me. Focus was on the fats and proteins, no grains or sugar. It worked wonderfully for last 3 rounds as I got smaller and smaller. To give you another example, one of my interviewees, Elke, from Episode 12, was not a sugar addict, but she loaded dirty her first round and says she felt simply awful the first week of hCG when she did that – the cleansing process and your body getting off carbs and switching to fat burning can be BRUTAL, and if all this work is saved till you get on hCG, it can compromise your ability to stand strong on the protocol and lead to cheating or giving up early because it feels so hard and you’re cravings are so bad. This is another unfortunate mistake that I look back on now and know what I should have done. It wasn’t simply the loading on sugar that ruined everything. That was just part of it. My health was on a down turn at that point – I think I was suffering from some adrenal fatigue and perhaps my Lyme was acting up more than normal – whatever the case I just felt awful. As a result I was finding it really hard to stick to the diet. I started feeling really depressed which made me not care, yet I kept trying to start fresh each day. I cheated a lot or ate foods that weren’t on protocol that a sane person would recognize as being not a smart choice – things like weird fiber cookies made with sugar alcohols – eating 3-4 of those INSTEAD of the calories I should have gotten from protein and vegetables. Nice Rayzel. Every day I’d consider not taking my shot, but then would go ahead and tell myself that today was a new day and maybe I could turn things around – but then I wouldn’t, day after day. In retrospect, I feel I should have been a little more in tune with what was going on and gotten off hCG as soon as I realized I justed wasn’t well. It’s possible if I had done this that I could have had the willpower to do my Phase 3 properly – but because I kept pushing the envelope I feel like I just literally wore myself out so that by the time P3 arrived, there was nothing left inside me and I basically just snapped. There is a good reason why we are supposed to wait till the hCG is out of our system to start incorporating higher calories and especially fats. I feel that the body is still especially sensitive to fats and being able to store it very easily while hCG is still in your system AND even those first days off hCG – that’s just what it seems like to me based on my own experience. So since I disregarded this 72 hour period entirely when I got off hCG and just started, well, eating, things didn’t go well. You can gain VERY quickly during this 72 hour period if you ignore it. I do think additional calories are often needed as the 72 hour period comes to a close and the hCG is almost out of your system, and I will link to my post on that here, but I feel sticking to P2 foods and no fats during this period is pretty essential. So yeah, for my supposed “P3” I basically didn’t do it. I just started eating what I felt like eating. Yes you read correctly. The girl who now lives on daily bunches of kale salads did that. This was not the only day – it just happens to be the only day I wrote it down since as you can see the following day I attempted to try to start fixing it by eating clean. I fell back into my binge eating disorder at that time. It’s a tough place to be in. And I wasn’t mentally ready to get back out of it for several weeks. I’m not blaming all that transpired on something outside myself – what I realized though is that my lack of knowledge about how things work in our bodies caused me to make some choices that I didn’t realize were poor decisions for me personally, and once I was headed the wrong way, I felt like I was more in a passenger position with less control over my choices. Coming to understand what set off my bingeing or other unhealthy eating or thought patterns allowed me to be the driver in the future and head in the correct direction. Okay so THAT was an all doom-and-gloom story wasn’t it? The good news is, we can learn from our mistakes. You can learn from your own mistakes, or better yet, you can learn from mine and not have to make your own! If you’ve found yourself in this Not-Gonna-Work-Way during Phase 3, you can check out my Help! I Royally Messed up in P3 article for my advice on how to get back on track. If P3 is still ahead, you can plan now! Now It’s Your Turn! Do you have a P3 story to tell, good or bad? Share it in the comments below! Thank you so much for this video. I am days away from beginning P3 and this video is exactly what I needed. You have been such an inspiration through my HCG Journey. I so appreciate your transparency and humility. You are helping so many people, including myself. Thanks for such an inspiring video!!! It is so nice to have hope that one day it IS possible to not crave binging anymore. thank you thank you! Thanks @christinamathewson:disqus I have discovered along the journey how very similar many of us women are! Another great video, I appreciate your authenticity! I have done hCG in years past and essentially ignored P3, and voila!, gained it all back and THEN SOME! My two P3 experiences this year, though, have both been excellent. My success began with recognizing that P3 is just as important to follow well, as P2 is for my weight loss goal to be realized. 1) Kept a food log that showed the fat, carbs and protein grams as well as daily weight. 2) Set daily calorie goals that increased by 100 every other day …. VERY SLOWLY. 3) Set carb intake under 20 gms daily, kept proteins at the target amount for my height, age and activity level, and slowly increased the fats to retrain the body to burn healthy fats instead of carbs. This was counter intuitive for my yo-yo dieter’s mind to wrap around, but it worked! In addition to a variety of proteins, vegetables, and low glycemic fruit, butter, coconut cream, and olive oil were my friends by the end of P3… all with not one pound gained back! I was pretty geeky about keeping such records, but it was my way of keeping the importance of good planning for P3 as high on my priorities as I had kept P2. Finding replacement foods was VERY important for me. As well, any time my thoughts turned to thinking things like, “As soon as I get off this diet, I am going to eat this chocolate coconut brownie with double fudge frosting,” I instantly corrected my thinking from the phrase “off this diet”. This protocol is unto a permanent lifestyle, a HEALTH style change, so I reminded my old habit not make that promise to my taste buds, a promise that would set up craving cycles again. Instead, I am learning to be in touch with my hunger/satiation/overfull sensations as I eat really help to know when and how to stop eating … and savoring every bite of healthy food is so fun! it! I am so grateful! I hope this is helpful to somebody! Thanks for sharing all these thoughts @Sunnie Side Up! Really appreciate it- lots of gems in there. @Sunnie side up- have I ever asked you if you’d be interested in letting me interview you? I think you have some great stuff I’d like to share with the hCG audience- if you’re open to it, email me at [email protected] and I can tell you how I do it. Thanks! Sounds great, I just emailed you. Keeping carbohydrate intake low is key but also focusing on the glycemic index is super helpful, avoiding foods like bread, pasta, and rice are obvious, as are sugar and other obvious starches. I think there is a type of bread that is actually acceptable to consume during phase 3 known as Ezekiel bread, mostly because it has no grains whatsoever, it has a taste that is hard to describe, but for those who like bread, it has far less calories and more nutritional value than other brands, and its made from organic ingredients, its very popular with body builders. I think legumes are okay during Phase 3, like black beans, I have not had a bad experience with them, the key to them is their fiber content, they take a long time to digest. Products like white bread, soda, typical starches that most Americans eat are what you want to stay away from for the 3 weeks minimum you are on phase 3. Also good quality fats are important. Grass fed butter is great and so is olive oil because they can curb your hunger and cause you to eat less. Look for quality and you can manage your calories much better. I would go to Bed Bath and Beyond or a similar store and get a kitchen scale and measuring cups to weigh whatever you cook so that you make the right portions and can estimate your calories. Thank you for sharing what you have learnt along the journey. Thanks for responding, Christina! Cheers!